One of the most commonly heard criticisms of karate that I hear among internal martial artists relates to the humble rising block. In karate the basic age/jodan uke is performed by facing your attack “head-on”. My emphasis on “basic” is important – I shall explain why later. The second thing to note about the karate rising block is that the forearm rises first,followed by the shoulder girdle (I discuss the basic karate technique in this article). It is this second point that attracts the criticism from certain internal arts schools. These schools insist that one should never raise the shoulder girdle. “It raises your qi” some of its practitioners say. What rubbish! What it raises is your shoulder girdle – nothing more and nothing less. And indeed, raising the shoulder girdle can create issues. Accordingly I will say at the outset that the criticism raises a valid point which needs to be addressed. Second, raising the shoulder girdle is relatively slow and weak. If you are relying upon this shoulder raise to effect your deflection, you are sadly misguided. Last, raising your shoulder girdle exposes your sensitive under arm to attack. It also enables your raised elbow to be manipulated into an unbalancing projection. If you combine these drawbacks, raising the shoulder girdle with your rising block appears to be a recipe for disaster. Yet this is precisely what the karate basic seems to suggest. So far you’d be excused for wondering whether there can be any logic at all to the basic karate rising block. However one needs to be careful about making rash conclusions from the preceding description. I have only given you part of the information you need to ascertain the application of the rising block in a dynamic environment. 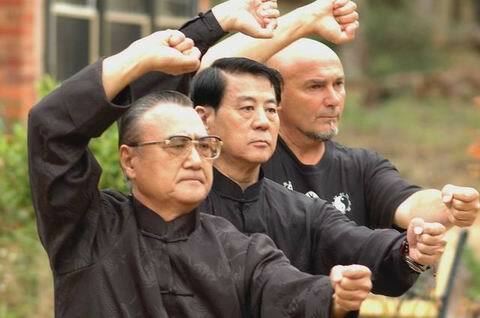 For example, I had one chap watching my taiji class one day. After the class he approached me with a sad, weary shake of the head and announced that old chestnut: “Your taiji knowledge is very shallow. I know this because you raise your shoulder girdle in the rising block.” I didn’t bother to argue with this fellow. Sadly, the internal arts are full of such “theorists” (this is no slight on my many worthy internal arts colleagues – we all know the type). I don’t want a student who has such a “full cup” and so little time to spare for a teacher who has been studying for more than 30 years (compared to his 2 or 4 years). His first mistake was to assume that I hadn’t encountered this issue before. His second mistake was to assume that his objections weren’t conclusively addressed by the context in which the technique was being applied. What this fellow didn’t know is that in Chen Pan Ling taijiquan, baguazhang , xingyiquan and shaolin quan the shoulder girdle is raised – but only as the body turns into the attack. In this context the dangers to which you might have been exposed evaporate; the body is turned by the time the shoulder girdle raises, putting your counter into prominence and your "raised" shoulder out of harm's reach. So, for example, the photo at the start of the article shows Chen Yun Chow, Chen Yun Ching and James Sumarac executing "pao quan", the "exploding fist" of xingyi. In it the same issues arise - ie. the shoulder girdle is indeed raised, but only as the body turns into the attack. This is true of pao quan even though it is a reverse technique; the body is still turning into the attack as your deflecting arm contacts. But why raise the shoulder girdle at all? But the question remains: what do you get in return for this raised shoulder girdle? Why would you do it at all? The answer lies in effecting a natural, whole body movement that adds stacks of essential momentum to your counter strike. The force you can generate as a result is really quite staggering. The simple truth is that when you raise your arm to block, your shoulder girdle will inevitably start to raise as you turn your body and counterstrike. Letting it do so is simply letting your body do what it naturally does – expand as you turn into the attack. And natural movement will always produce a more efficient, synergistic body use. In this case the shoulder girdle raise corresponds with the “equal and opposite reaction” to the counterstrike, comprising a high pullback which balances your strike – much as a runner’s arm swings counterbalance the body for a more efficient running gait. And just because you've raised your shoulder girdle as part of an "expansion" powering your counter, doesn't mean you have to leave it there. On the contrary, since no position is "held" in any martial art, the shoulder girdle quickly drops down as soon as the "expansion" is finished. In fact the "steeple" interception, the rise/expansion and the subsequent drop are all part of a single flow of movement. Now compare this with keeping your shoulder girdle rigidly down – even when it is highly artificial to do so. I call this a triumph of dogma over common sense. This is really no different to a runner keeping his or her arms strapped to the sides to “stop them swinging”. So what about the karate version? Coming back to karate, its basic rising block is indeed performed with a raised shoulder girdle while facing “head-on”. But it one should never lose sight of the fact that it is a basic. All karate basics are practised “head on”. They are never applied this way, particularly when it comes to deflections. All karate deflections rely upon body movement or evasion (taisabaki or tenshin). In short, the karate basic isolates the arms so that beginners can focus on getting that part right. It is not designed as a “fighting technique”. It is undoubtedly true that a rising block/deflection has principally achieved its task well before the shoulder girdle is raised. But it is a mistake to assume that the story ends there. Upward momentum is not so easily halted. Nor do you want to. In fact you want to conserve and harness this momentum as much as possible. How do you do this? By converting the upward movement into an “up and sideways” movement with a body twist. The natural “expansion” of your upper body after the interception/deflection enables you to throw your whole bodyweight behind the counter, while simultaneously moving your unprotected underarm and elbow out of the way. On the other hand you have the poor unfortunates who have keep their shoulders rigidly held down as if they were stapled in place or hiding sweat stains. All because somebody said told them that raising their shoulder girdle “raises your qi”. Hmm. question: do you have any idea how many schools do the age uke as i was taught it in hayashi-ha shito-ryu? (ie with the elbow extended at more than 45 degrees, relying on spiraling to block, which i personally prefer massively to the 45º age-uke). 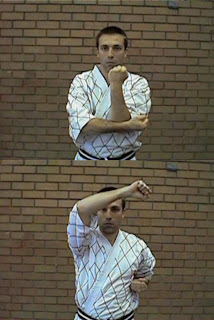 additionally, IME shoulder down works when you're doing an age-uke with gyaku-kaiten, such as when stepping in offensively (even using the age uke as a short mawashi-zuki, or as a pseudo hammerfist to jam the face while you continue advancing). thing is, it isn't really "the shoulder girdle goes down", it's more like "the shoulder assists the movement". sadly, it has been my experience that the general methodology of basic karate training is to treat the newbie as a complete moron and give him/her generalized instructions that can be followed en masse by big classes, giving rise to this kind of misconception. thoughts? I've heard the same complaints, usually by the same "theorist," those long on gab & short on practice. It is a basic block that, as all techniques, reveals its secrets through years of practice. Like all blocks, it is open to other possibilities as one evolves in one's practice. But here's an anecdote: Hired help I had felling a tree was up in the branches sawing of a pretty wide one while I held a rope to guide it safely away from a neighbor's fence. Things went awry. Out of sheer reflex, up went my trusty head block, deflecting the mother from my noggin.So you see, you never know when a head block, girdle and all, may come in handy. No, I don't know the stats on who does the greater than 45 degree angle. I certainly prefer an angle greater than that in application, though for the basic I teach the "standard" for "en masse" big classes! Why? You need some kind of standard, I suppose - and the standard can be applied in a number of ways, depending on context. The sharper angle block is something I call the "steeple" block. It is used very often in some of the Chinese schools I've studied (Tang Shao Dao) and it occurs in Naha te seisan, kururunfa (if you know where to look). Shorin styles tend to do the more basic 45 degree angle. I like your thoughts on gyaku kaiten and stepping in offensively. The drawback of that approach is it can cut off your other hand. Well said Jorge! The technique works - what more proof than a reflex action in surprising circumstances! No idea about karate priciples, Dan, but I wonder why you didn't bring in the fire technique of the wuxingquan. Here, in my training it is all about angles. Point of contact with the duifang at your arm,cirling your body around to the side, keeping that contact, and lowering the ellbow rather quickly. Does it make any sense? 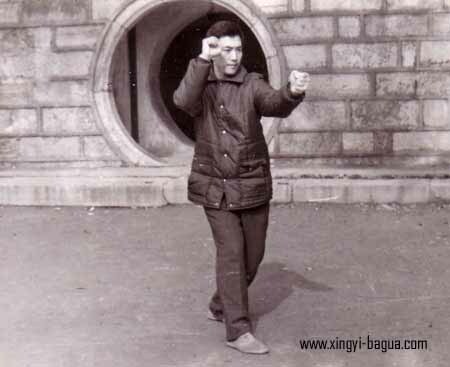 Yes, the picture at the start of my article is pao quan from the xingyi. The same thing applies - you turn your body into the attack (albeit in a reverse attack). The shoulder girdle is clearly raised. As you point out, it quickly drops - but then again, this is what we all do anyway. No position is ever "held" for any length of time in fighting. Nice one Dan (this one and all your other recent posts), as usual. I wonder why that guy who went to see your class didn't phrase his opinion differently, something like "Hey, I noticed you raise your shoulder girdle, but I've been taught differently, can I ask you why you do it that way?". I try to remember that I don't know what other people have studied or trained, so I really can't judge their martial skills - unless what they are doing seems really wrong, in which case I'll tell myself: "I don't like that". Thanks Pablo. Very good point about beginners - they need to learn to walk before they can run. Why didn't this fellow rephrase his question? Pure rudeness, brought about by some kind of righteous conviction. I'm certain his teacher filled his head with stories about inferior schools and styles. The fellow obviously put me in the same basket. Once you have such blind prejudices, rude behavior probably seems justified! Your point about stacking momentum into the counter with the follow-through motion of the girdle is, I think, precisely what we harness in parkour training: we swing the arms fully up and forward (as I understand it, this is called the set, or setting (? ), in gymnastics). Flinging the arms is about 30-40 lbs of weight/mass that helps you to further propel yourself forward in a broad jump. And yes, I've also found through experience that the actual blocking and striking (whether unarmed or with weapons) needs mostly just the steeple to deflect. In fact, when I relatively unanchor my shoulder girdle by raising it up, into a block, my shoulder joints risk more shock. Clearly, my body awareness, deflection skills, and fitness conditioning have far to go, as I strained the left rotator cuff for a few months. Since my recovery, I've stayed conservative and used mostly steeple motions in the deflections, and even in my follow-up counters. I am working in more commitment of a raised shoulder girdle in some cases again (as well as a progression of declined to handstand pushups for fitness), but I largely don't miss it.